A quick post today because I’ve been busy enjoying a family-inspired rest from the bike. While touring my sister around Provence yesterday I stopped in at the place below, which was unfortunately closed. 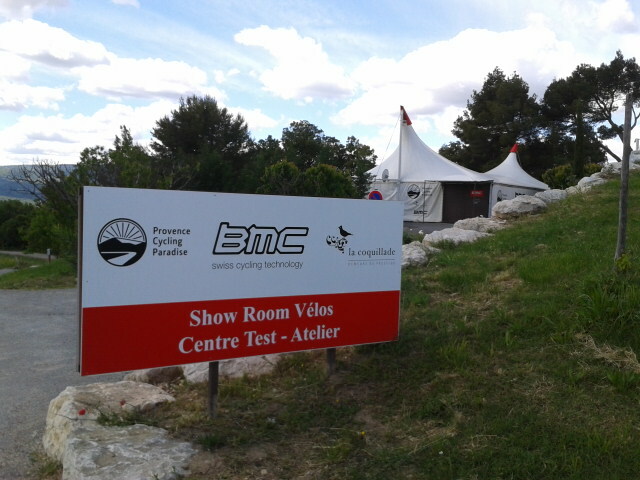 This is a BMC Test Center, where you can check out the latest offerings from Cadel Evans’ Swiss bike maker, as well as take any of them out for the day (for 40€). It is also on the grounds of a really pretty and posh vineyard that allows visitors to stroll through its vines. Needless to say, I’ll be back. With a forced 3 days off with man flu, I think I’ve become a little partial to that BMC e-bike with its by-line ‘avoid sweating…..’ Enjoy your break. Back on the bike today, but man it’s cold down here. Suppose it’s snowing where you are, so shouldn’t complain too much. Apparently snow at the 500m level. None in town but getting tired of this wet cold weather. Friend in Dublin says its coldest there since 1883!! Paris had its lowest overnight temp for this day in May since 1887. Bring back global warming! Hamburg is wettest May since they write downords. At least it’s relatively dry down here. no good excuse not to get out on the bike. Lovely sunny day here and happy with my old bike so all well with the world. Sunny here, but wouldn’t say ‘lovely’. Glad you’ve got it good. Forecast to snow here tomorrow. Windy, rainy, cold for 6 days now. Bltgrgrghhbhh …. ‘Thanks’, Nigel. Hope you’re out on the bike then! I had a reservation last year for lunch in the garden restaurant of this hotel and didn’t get to go because my travel companion’s bike didn’t arrive into Paris, which set all our plans awry and I had to leave Provence a day early. Looks like it would be a fun afternoon with the test center there now. Thanks for sharing the news. Gerry, My brother Mike stopped by the BMC test center today, following your tip. Also after he rode Mt Ventoux from the Malaucene side, he and his wife and a friend took the car tour loop Crestet – Gigondas that I had written about last year. They then had dinner at La Fleur Bleue restaurant (recommended!) 1km outside the town of Crestet, they said it was very special. Thought I would reciprocate a good tip with you, http://www.lafleurbleue.fr/restau/en/photos. Your brother chose wisely, going up the Malaucene side, with the wicked wind we’ve been having. It would be a lot more ‘friendly’ from the north side right now. Thanks very much for the restaurant recommendation, too. We’re going to working on a Provence tour for next year pretty soon, so this kind of intel is golden. Thanks!